The very early stages of human habitation on Naxos are lost in the mists of myth. Naxos features prominently in Greek mythology. In this island Zeus, Apollo, Dionysus and Ariadne, Demeter and Artemis were worshiped above all. Zeus, father of all gods, was born in Crete but was brought up in Naxos in his honor the inhabitants named the island’s tallest mountain after him (Zeus or Zas). On the peak of Mt Zas an eagle gave Zeus the thunder, through the power of which he became ruler of Olympus, home of the gods. Zeus fell in love with Semele, daughter of the king of Thebes. The jealous goddess Hera beguiled the young Semele into asking Zeus to appear in front of her in all his divine splendor. Zeus granted her wish, but the mortal woman could not bear the awesome sight. She perished, but Zeus saved their unborn child. He stitched the embryo into his thigh, whence Dionysus was born, in Naxos. Although the core tradition is that Dionysus was then carried off to the distant Mt Nysa in Asia, another one claims that the Nymphs Filia, Kleide and Koronis took over Dionysus’ upbringing, hiding him in the cave of Koronos, which the local folk call «evil». The people of Naxos worshipped Dionysus who in turn blessed their island with rich vineyards. Naxos is also the island where the ships carrying home the future king of Athens, Theseus, made a stop. Theseus was returning home a victor having killed the Minotaur, the beast-like guardian of the Labyrinth (half bull, half human) son of Minos. He had also eloped with Ariadne, daughter of Minos, who helped him complete his difficult task. 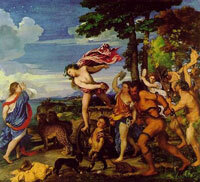 The god Dionysus, however, had also fallen in love with Ariadne. He came to Theseus in his sleep and convinced him to leave Naxos at once. With Ariadne now alone, Dionysus appeared to her and made her his wife. 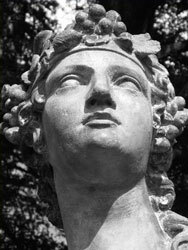 Should you look up to the skies on a clear night try to spot the Corona Borealis: it is said that Dionysus used this constellation to wreath Ariadne’s beautiful head.